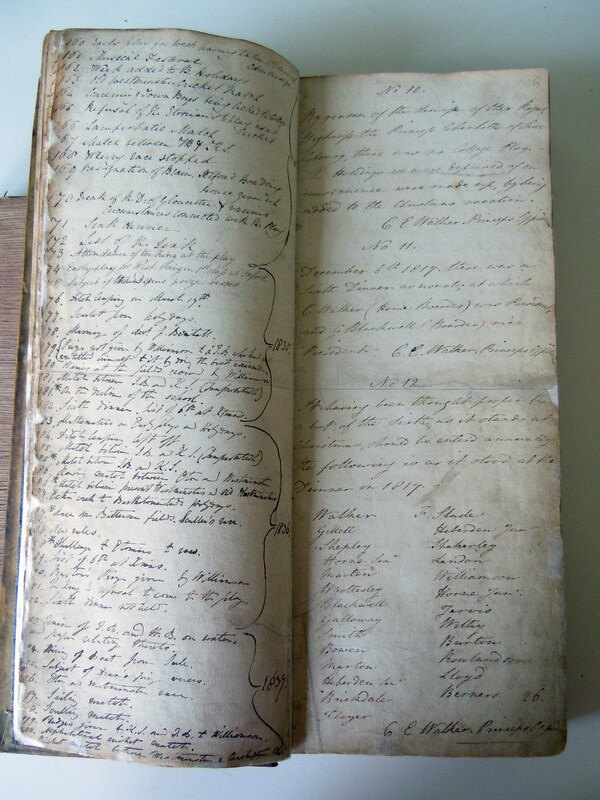 In 2014, Ann-Marie Miller, accredited freelance conservator, was invited to inspect the Town Boy Ledgers and provide recommendations for their repair. 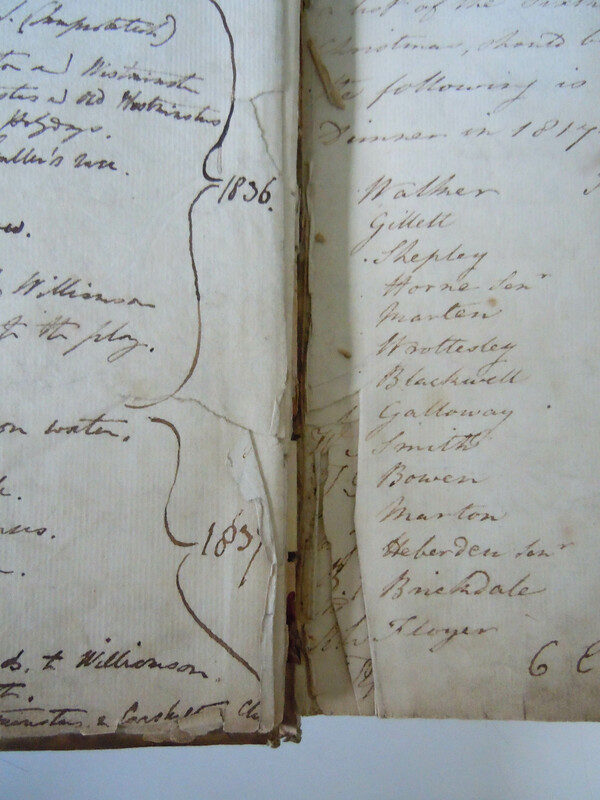 Sadly weak bindings, detached and damaged pages as well as evidence of mildew meant that the ledgers could no longer be safely used by pupils or readers. 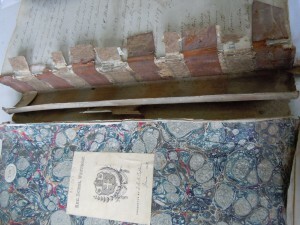 Having examined each of the seven volumes independently, the common concern affecting their immediate condition and the limitation of further damage was to restrict handling of the bindings, especially the degraded leather over bands. These had suffered losses to varying degrees and were affected by “red rot”. There was also suspected active mould on a number of the volumes and this had health and safety implications for readers. Following a successful application to the National Manuscripts Conservation Trust, the school received a grant to help with the cost of conservation. This enabled all seven volumes to be conserved at the same time by Ann-Marie, ensuring continuity of approach. Suspected areas of mould damage were mechanically dry cleaned to remove loose matter and spores, and documented prior to regular monitoring in the environmentally managed archives. Paper repairs were performed in situ throughout, with any loose sections being fully re-integrated into the binding’s engineered structure. Minimal intervention was the overriding approach to the books’ conservation treatment, preserving the original materials whilst improving the bindings’ function. 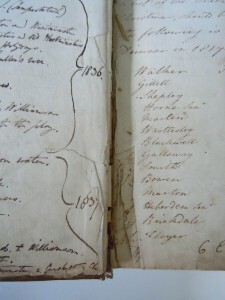 Any losses to labels and over bands were not generally infilled as they do not affect the engineered structure of the book. Where cracking of the over band leather meant that it was liable to loss, toned Japanese paper was used to secure the edges. Finally the Ledger’s existing conservation grade boxes were reused after a light dry cleaning to remove red rot and other engrained dirt.